Over a month ago, Nedim Cavcic and his eldest son, Eldin, went out to get doughnuts at Krispy Kreme. 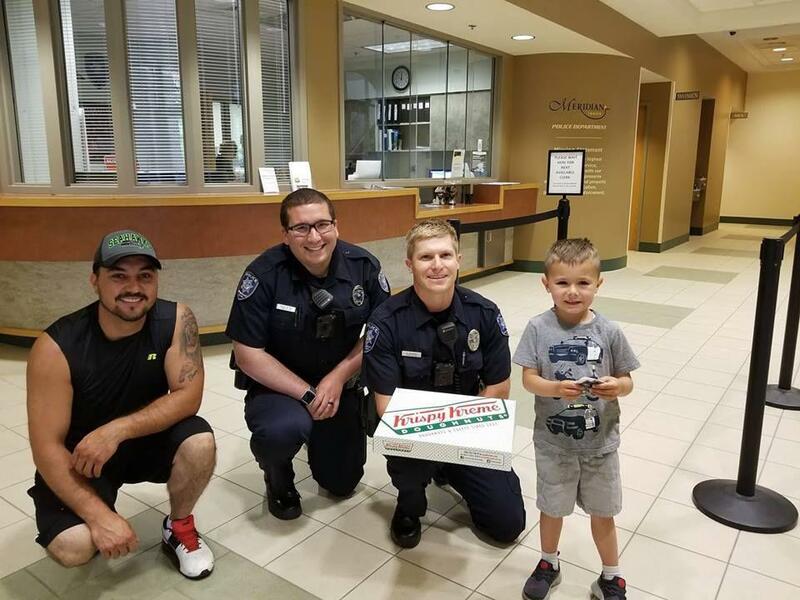 While there, then 4-year-old Eldin in a gray T-shirt with police cars on it thought of a perfect way to spread thanks to first responders: get them doughnuts. He’d heard on YouTube that police officers liked them. So, the two paid a visit to the Meridian Police Department afterward to drop off a dozen, on May 25. Two officers greeted them, posed for a picture and even gave Eldin, who turned 5 in June, a sticker police badge. It put him one step closer to becoming a bona fide police officer ready to patrol the streets on his scooter or bike, both fitted with sirens and lights, or his drivable power wheels vehicle that resembles a police car. “It just made his day. We got in the truck and started driving off, and then he started asking if the police were proud of him,” Nedim Cavcic recalled. Just over a month later, Nedim Cavcic’s support of police went far beyond doughnuts. On July 1, he rushed to help an officer who had been shot. The officer, Kyle Mikowski, was pursuing Daniel Isaiah Norris, a 33-year-old Meridian man on the Idaho Department of Correction’s Most Wanted list. Police say Mikowski chased Norris on foot and hit him with a Taser. According to police, as Norris was falling, he shot Mikowski, hitting him twice in the lower legs. The officer shot back, and Norris died at the scene. Two civilian witnesses, including Cavcic, helped the officer. Cavcic, owner of E&E Construction LLC in Boise, was installing kitchen cabinets at a nearby house as the shooting occurred. He quickly came to the aid of Mikowski, controlling his bleeding and comforting him as emergency personnel raced to the scene. Mikowski underwent surgery and returned home Monday to recover. In a press release, the police department praised the two citizens who helped. That included Cavcic and another person who called police, witnesses said. It was only after an ambulance picked up Mikowski that Cavcic realized he was the officer who had posed in a picture holding the box of doughnuts. Cavcic said he’s considered reaching out to mental health professionals for help, and said he was given contact information for some by first responders at the scene. Cavcic said his two boys, Eldin and Elmin, 2, love police officers. Fittingly, Cavcic said one of his sons’ favorite songs is “Bad Boys,” the theme song of the TV show “Cops.” They can even be seen jamming to it together in a June 19 Facebook video, one day after Elmin turned 2. Still processing the events of July 1 himself, Cavcic hasn’t talked to either of his boys about what happened. At the time, he said the two were camping with their mother, who told them a bit of what happened — “we helped a police officer and we got a bad guy,” according to Cavcic. Meridian Police issued a news release Tuesday clarifying the events that led up to Sunday’s shootout. Officers were discussing an unrelated call in a parking lot Sunday in the area of South Eagle Road and Overland Road when they saw a Dodge Durango in the parking lot. The vehicle left after noticing officers, according to the press release. When officers checked its license plates, they learned the registered owner of the vehicle had a warrant for his arrest. Officers, who were cleared from the earlier call, searched for the Durango. Mikowski located it at Maple Grove Road and went to initiate a traffic stop, but the Durango turned around and stopped near Mediterranean Drive and South Crimson Rose Avenue, according to police. Police say this is when Norris and a woman who has not been identified exited the vehicle. Another male suspect who turned himself in on Sunday, mentioned in the Meridian Police Department’s initial press release, was the owner of the vehicle and had an outstanding arrest warrant unrelated to the event. The department is treating him as a witness, and declined to identify him, Deputy Chief Tracy Basterrechea said. He turned himself in on Sunday and has been released from custody, as he had return of recognizance warrant for a misdemeanor failure to appear charge, Basterrechea said. When Norris and the woman got out of the Durango, Mikowski also left his vehicle and pursued them on a walking path. Police say Norris dropped drug paraphernalia and ran. While Mikowski chased Norris along a dirt path and through a yard with house under construction, the female suspect fled. Basterrechea said the department is still searching for her as of Tuesday. They believe they know her identity, but Basterrechea said they are also treating her as a witness and declined to name her. According to police, witnesses say Mikowski, during the chase, warned Norris he “was going to be tased.” When the officer deployed the Taser in a yard in the 1900 block of South Cressida Place, Norris began to fall forward and drew a 9mm handgun and fired it at Mikowski, according to police. Mikowski returned fire and struck Norris, according to the press release. A Boise Police Department officer who responded began lifesaving measures on Norris, but according to the release he died at the scene. Following the shootout, Cavcic, who had been working on the house, helped Mikowski while another witness called 911. The release stated Mikowski applied a tourniquet on one of his legs and an Ada County sergeant who arrived on scene applied a tourniquet to the other leg. Norris was wanted on a parole violation warrant and had a criminal history including kidnapping and robbery, according to the Idaho Department of Correction website. Mikowski has worked for the Meridian Police Department for over a year. Before that, he worked for other law enforcement agencies for over eight years. This was the second officer-involved fatal shooting for the Meridian Police Department in nine days, and the 10th in Idaho so far this year, the Idaho Statesman first reported. The other Meridian shooting took place June 23, when a man pulled out a non-firing replica revolver and was shot by officers responding to a 911 call. Published: July 4, 2018, 9:04 a.m.